But the second one, even brought tears to my eyes. And at the back there missing a spoiler. 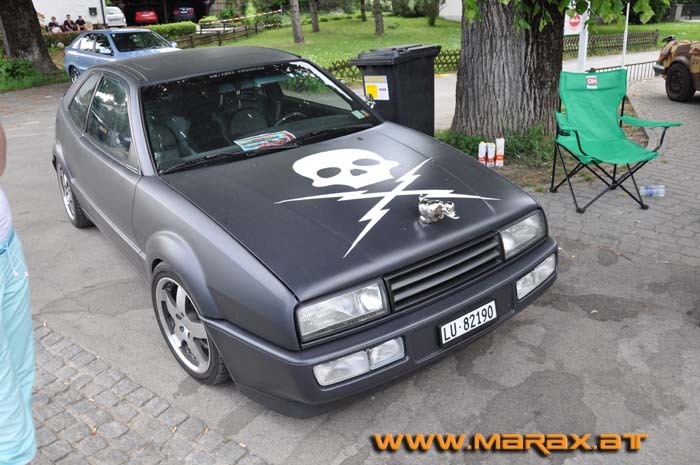 Corrado Haters Does Excist !! the owner of that car lives not from me. A friend of mine once had a litle flirt with that guy. his first car. He and his dad built the car together ..
i dont know what to think of this.. i know its an audi grill but the whole front reminds me of an alfa romeo! Well I gotta say it doesn't disgust me...but it doesn't look like a Corrado anymore! It might as well be a Sube. is that a lcd screen in his front? i didnt like both to be honest.Actually the second one is better, cuz it has more lines of a corrado.But the interior...uuugggh . And what is the use of the LCD on the bugatti look-a-like grill? the second one was at w�rthersee 09 right? i`m pretty much glad that the body of my C is stock...only the batches on the tail are clean. this one is totally not MY style! but thats my opinion no affence to the owner who put al lot of work in this car! but i do like the interior of this one! this is one for the junkyard not saveable!!! hmmm i wouldnt pay it !! these corrados�s i�m sad they can�t be pretty. it's incredible. they don�t look like corrados. we hope that a few are left . which look good.